The Constitution says a person must be at least thirty-five years old to run. As we know, an ideal candidate should be someone who empathizes with rural America. Gia lives on a farm. They should understand the importance of having access to quality health care. They should be able to stand up to Putin. Gia has taken on another terror from the East, Sandra Perkovic, many times and during the 2013 and 2014 seasons handed the Croatian Sensation her only losses. They should be tough as nails. A year ago, Gia was so hobbled by a back injury that she could barely bend over to pick up her discus. This past weekend, she won the USA Championships. I know how injured Gia was last summer because I saw her throw at North Central College in a last ditch attempt to see if she’d be able to compete at the Olympic trials. She literally hobbled over to the cage during warm-ups and limped out of the ring after each attempt. It was really tough to watch. I don’t know anyone in this sport who does not love and respect Gia, and to those of us who were at North Central that day it was pretty clear that Gia’s career was over. At her age (Sorry, Gia. I know we often talk about you as if your expiration date as an athlete has expired) it was hard to imagine her coming back from that severe of an injury. But come back she did. According to Gia’s coach, University of Illinois head track coach Mike Turk, her back problems first emerged in August of 2015, as she was preparing for the World Championships in Beijing. Unfortunately, nothing helped and according to Coach Turk, Gia “almost pulled out of the meet before qualifying.” She gutted her way though the prelims, but finished 11th with a throw of 60.55m, almost nine meters below her PR. Her back problems (it turned out to be herniated discs in L4 and L5) plagued her throughout the 2016 campaign. Coach Turk recalls the low point coming at a meet in April when Gia told him though tears that she “could not do this anymore.” Her back hurt so much that she had to have someone hold her place in line during warm-ups so she could rest between throws. Two months later, she was forced to withdraw from the Trials. No one would have blamed Gia if she had decided to call it a career, but having fought for nearly fifteen years to make it to the world class level (she threw her PR of 69.17m at the age of 35) she was determined not to give up. Coach Turk says that Gia’s agent, Karen Locke, was instrumental in turning things around. Locke referred Gia to a medical team in Los Angeles, and one of the first things they did was to treat a leg length discrepancy that apparently caused a lot of undue stress on her lower back. Late in the fall of 2016, Gia was able to start training like a discus thrower again. But progress was slow, as she had missed an entire year of serious strength training. Finally, in May, her power made an appearance. 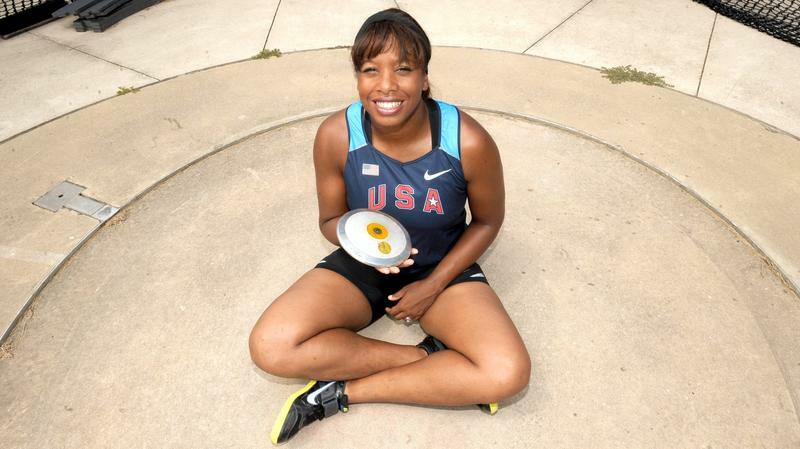 She hit 62.95m to get the A standard, then followed that up on June 2nd by drilling 65.81m at the Tuscon Elite meet. Coach Turk was pleased, but not shocked by those distances. Though her winning toss in Sacramento (62.65m) was, by Gia’s standards, not a bomb, she and Coach Turk were happy with it for several reasons: the 100-degree temperature, the 10:00 pm in Illinois starting time, the fact that she had been for all practical purposes crippled twelve months earlier. “The goal was to make the team,” he explained. “For sure you want to win, but she really wanted to prove that she wasn’t too old, that she could come back at the age of 38 and make another team. And when people wonder how much longer she can throw, that’s the answer: as long as she keeps making teams. Next up is a short trip to Europe, the first time this year that she will be road testing her back overseas. Turk is not worried about her ability to withstand the rigors of such a trip. In terms of strength, Gia’s lifting numbers (she focuses on dead lifts, power cleans and bench press) are close to 90% of what she was lifting when she threw that 69.17m. Around the first of August, she will pack up that strength, a couple of discs and an over-sized load of determination for a trip to Birmingham where she will make her final preparations for the Worlds in London. Coach Turk says that he and Gia have a theme for this season: The Story is Not Over. With luck, the story will continue all the way to Tokyo and the 2020 Olympics. After that, Gia might need to find a new passion. Gia. The country needs ‘ya! 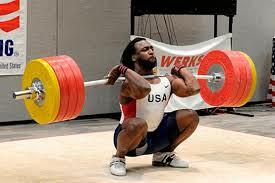 In the days leading up to the USA Championships, one’s thoughts turn to big throws and those that produce them. One of my favorite contenders to make the team for the World Championships in London is the American record holder in the women’s hammer, Gwen Berry. Gwen was nice enough to chat with me for a few minutes recently. Here are some things I learned from our conversation. The woman can handle adversity. 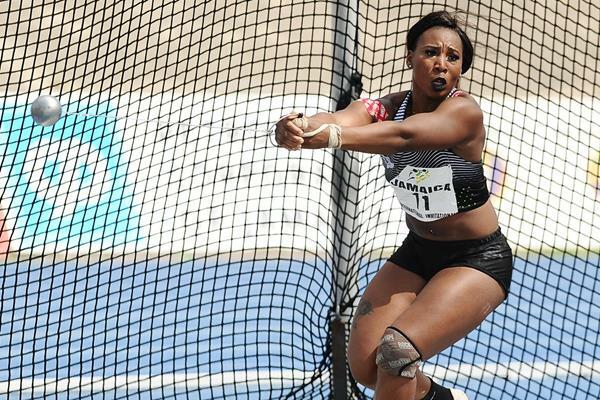 In May 2016, Gwen broke the American record in the hammer with a toss of 76.31m at the Ole Miss Classic in Oxford, Mississippi. That throw earned her $30,000 in performance bonuses. She got to keep none of it. Basically what happened was that Gwen got suspended by USADA in the days following her American record throw because several weeks earlier she had self-reported her use of a common asthma medication called Breo. She never failed a drug test. There was never a question of why she took Breo. Simply put, she has asthma and like many people with asthma she needs medication once in while to be able to breathe. In the end, Gwen was given a short suspension, which ended just in time for her to compete in the Trials. She was, however, stripped of her American record and the $30,000 she had earned in setting it. I don’t know about you, but were I Gwen, I’d have been more than a little chapped. And I, for one, would not have blamed her if after breaking the American record again this spring–this time with a toss of 76.77m–she’d have directed some choice words and perhaps a celebratory middle finger USADA’s way. But, Gwen is not like that. Gwen Berry and Morgan Spurlock have something in common. The main consequence was that subsisting on a McDonald’s-only diet made him feel like crap. After qualifying for the Olympics last summer, she arrived in Rio two weeks before the women’s hammer competition. The plan was to get acclimated to her surroundings and develop a routine that would help her feel comfortable when it was time to compete. But she could not stomach the food in the athlete’s village, and McDonald’s was her only alternative other than a two-week fast. So, in the days leading up to the biggest meet of her life, Gwen took every meal under the golden arches. Like Spurlock, her McDonald’s binge made her feel awful, and she did not qualify for the hammer final. She is ready though, if she makes the squad for the World’s in London, to try a different tack. According to Coach Smith, jet lag tends to hit athletes three days after arriving in a distant land, so Gwen will have to cut it pretty close and literally show up two days before the hammer prelims. She is confident she can make it work. Gwen can throw great, even when her back is killing her. When my back spazzes on me, I like to lie on the floor and whine so that my wife will bring me snacks. Gwen is made of sterner stuff. This past February, a month before the USA Indoor Championships where she was scheduled to compete in the 20-lb weight throw, Gwen strained her back so badly that she could barely throw or lift. According to Coach Smith, her workouts during the four weeks prior to the championships consisted almost entirely of back rehab. Two weeks out, she was convinced that she would not be able to compete. Ten days out, she was able to throw a 25-lb training weight about 18 meters, and Smith convinced her to go to Albuquerque and take a whack at competing. She did, and ended up throwing 25.60m to break the world record. College kids these days are really soft. Back in my day, if you stayed up late reading Goethe and got a craving for a freshly baked cookie you were out of luck. Even if you could convince a fraternity brother to take a break from his quantum mechanics homework and drive you to Seven Eleven, the freshest thing you could get was probably a pack of Chips Ahoy that had been on the shelf since the mid Phanerozoic Eon. It was balderdash, I tell you. But times have changed, and now if you are a student at Ole Miss you can get freshly baked cookies delivered to your door any time between the hours of 9:00am and 3:00am. And the person who delivers them to you might just be the American record holder in the women’s hammer. One of those times is right now as she prepares for the US Championships. If she makes the team for London, her hiatus could be extended for a couple of months. Coach Smith says that she is ready not only to make the team but to extend the American record. 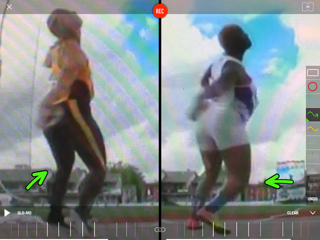 His hammer throwers train with a wide variety of implements–heavy and light on both regular and shortened wires–and he keeps meticulous track of how far each thrower throws each implement each practice. So, if you happen to be in Oxford, Mississippi this fall and find yourself ordering up a late-night cookie, be ready. When you open your door you may well come face to face with a World Championships medalist. And one of the nicest people you’ll ever meet. 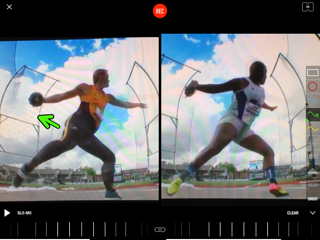 Watching the NCAA women’s discus final via the ESPN webcast last weekend I was struck by two things. One, it’s not only high school officials who are nuts. The college guys are as well. Two different throwers whanged a disc off the cage so hard that it ricocheted straight up before coming to rest on the turf a few meters from the ring. Both walked away assuming it was understood that they did not want those throws measured. Both assumed wrong. Ten meters forty. Eight meters sixty. You can look it up. 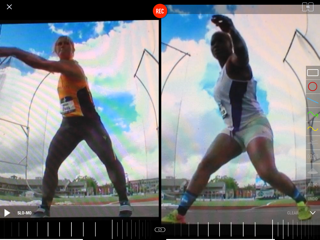 The second interesting thing about the competition was the sixth round when Kansas State’s Shadae Lawrence and Arizona State’s Maggie Ewen hammered great final throws. Shadae went 61.37m for the win. Maggie, after being pushed into third place by Shadae’s toss, responded with her best effort of the day, 60.11m, to take second. You can see those tosses on Macthrowvideo.com. 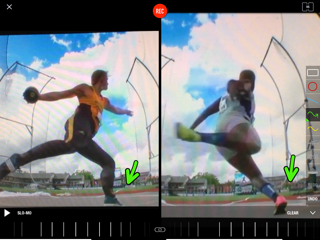 Right now, I’d like to take a look at some stills from the vids of those throws because I think they reveal why Maggie came up short in her effort to add a discus title to the hammer gold she’d won a couple of days earlier. Shadae has an unusually wide base here, and she uses a rigid right leg to keep her center of gravity from sliding to the right during her wind. I assume she does this to expedite the all-important transfer of weight to the left prior to entry. 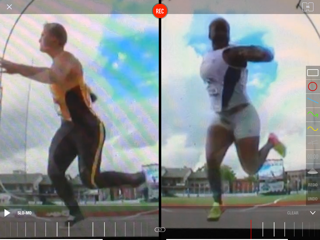 At first glance, both throwers appear to be in good shape. Each keeps the disc back as they swing their left side open. 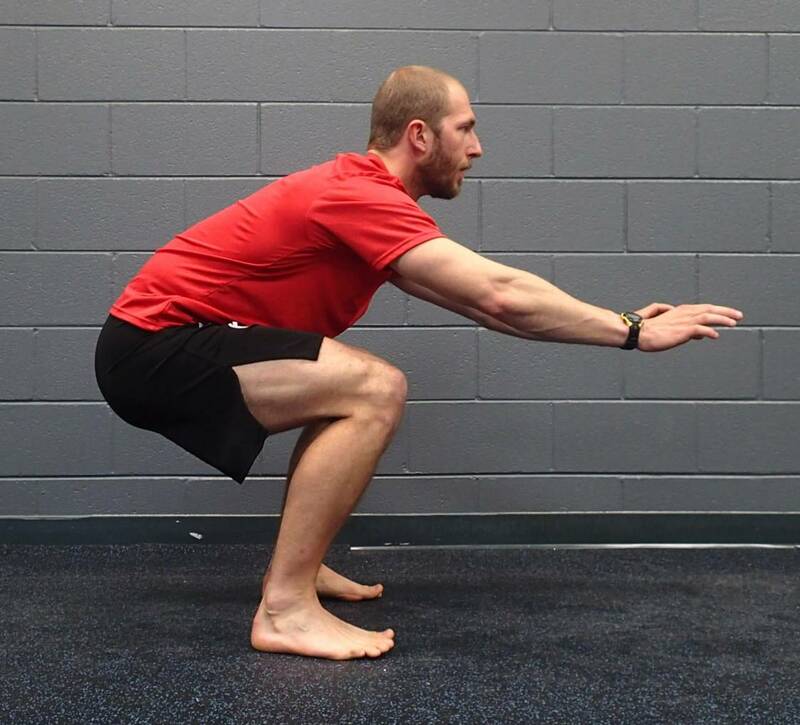 Their shoulders are level. The difference I see is that Shadae has turned her left foot harder and pushed her hips farther to the left than has Maggie. In fact, it looks like Maggie’s hips are sliding to the right a bit as her upper body turns and her left arm reaches left. 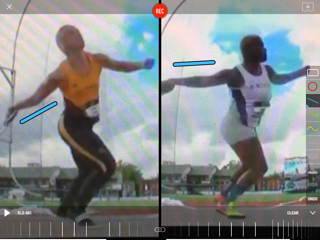 A couple of frames later, we can see that Shadae has continued to turn her left foot more aggressively than has Maggie, and that Shadae’s hips are opened much farther towards the direction of the throw. They both do a nice job of getting their right leg out wide, but Maggie’s left foot has stopped turning, leaving her in the position of having to run one direction while her left foot points in another. 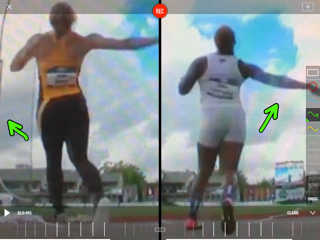 You can see that her discus is rising up a bit, which may indicate that her shoulders are too far out in front of her hips and she is falling into the throw. Here they are just before right foot touchdown. They look pretty similar at this point, but if you take a close look at the video, you’ll see that as Maggie lands, her right leg has to absorb quite a bit of shock– another indication that she is falling rather than running as she travels the ring. You can see some of the effort that Maggie has to exert here to absorb the extra shock of landing off balance. It is probably that shock that has caused her discus to drop just when she’d like it to be rising up to a high point. Here is the moment of left foot touchdown. 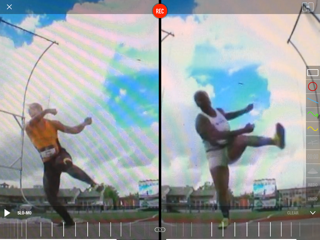 Both have done a nice job of keeping their weight back on their right leg, but Maggie’s disc has dropped while Shadae’s is in an ideal position. 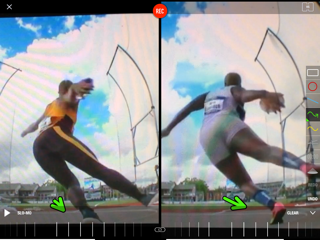 Both do a great job here of getting the right heel up before the disc sweeps past it. Unfortunately for Maggie, her center of gravity has shifted prematurely to her left leg while Shadae has stayed back on her right. 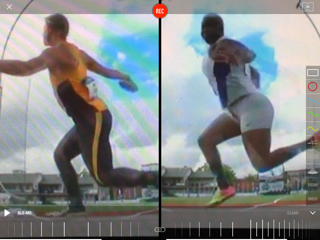 Notice the direction of their hips at the moment of release. Maggie has a nice left side block and a super long right arm, but her momentum is pulling her toward the left foul line while her throw ends up landing near the right foul line. Shadae is on balance, her hips squared up in the direction of the throw. The follow through on a throw is often a good indicator of how well the athlete maintained their balance while running the ring, and you can see that Maggie is falling off to the left. It took every ounce of her considerable athleticism to save this throw. 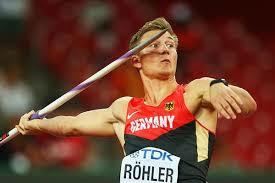 Most coaches will tell you that the success of a discus throw is determined by what happens at the back of the ring. That is absolutely the case here. Shadae did a better job of shifting her weight over an aggressively turning left foot. This allowed her to run the ring on balance and produce a more efficient throw. Let me conclude by noting that Maggie’s throw, though not technically perfect, was a big time clutch effort. As was her NCAA record throw in the hammer. As was her sixth place performance in the shot. Clearly, she is one of the finest throwers in NCAA history, and fans of the throws have a lot to look forward to next year as Maggie and Shadae will both be back.